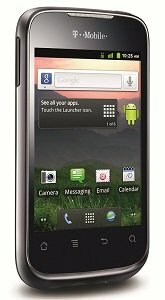 Powered by Android 2.3 Gingerbread and featuring a 3.5-inch HVGA touch screen, the T-Mobile Prism 3G smartphone enables T-Mobile customers to easily surf the Web, access their favorite social networking sites and choose from thousands of applications to download from Google Play. The T-Mobile Prism also makes it simple to capture and share photos and videos via its 3.2-megapixel camera with digital zoom and video recorder. With the T-Mobile Prism, customers can sync multiple email accounts, including Microsoft Exchange, Google calendar and contacts, T-Mobile contacts, and more. The T-Mobile Prism also features Wi-fi capabilities. It also contains 512 MB of internal memory, 600 MHz ARM, and supports up to a 32 GB microSD card. The T-Mobile Prism weights 4.4 ounces and measures 4.58 x 2.37 x .48 inches. Its 1400 mAh battery allows up to 6.5 hours of talk time and 400 hours of standby time. With T-Mobile, you get the power of a great phone with the flexibility of a no annual contract plan. Buy minutes and talk and text away. When you run out, come back and buy more minutes. It’s a simple way to stay connected with no monthly payments, no hidden fees. $0.10 to send/receive texts, $0.25 to send/receive pictures and videos. With Gold Rewards status, you automatically receive 15% more minutes for free, and any unused minutes won’t expire for a full year. To qualify, spend just $100 (in any combination of $10, $25, $50, or $100) in T-Mobile refills for your Prepaid phone. If you buy a combination of refills that add up to $100, you’ll receive 15% more minutes free on the NEXT refill card redeemed. If you buy a $100 refill card, you’ll automatically qualify for Gold Rewards status, and the bonus minutes will already be included in the card. Pay by the day, and only when you use your phone. Great for web surfing, emailing, talking, and texting. 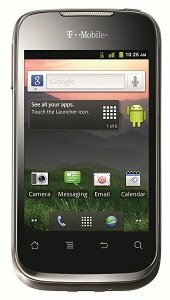 The T-Mobile Prism runs the Android 2.3 operating system (dubbed Gingerbread)–the fastest version of Android available for smartphones yet. It features a cleaner, more refined interface with new icons, improved top notification bar, and more intuitive navigation. The Prism also brings one-touch access to the popular Google mobile services you use every day. It also provides easy access to both personal and corporate e-mail, calendars, and contacts supported by Exchange Server and Gmail. And through Android Market, you’ll get access to thousands of useful applications, widgets, and fun games to download and install on your phone, with many more apps being added every day. Simple user interface ? customizable home screen, full HTML web browser with Flash support, visual voicemail, and Swype. Start using Facebook®, TwitterTM, LinkedIn, Telenav® and other popular apps. I like the helpful info you pvodire in your articles. Ia1a6ll bookmark your blog and check again here regularly. I’m quite certain Ia1a6ll learn plenty of new stuff right here! Good luck for the next!